Whatever you consider the significance of this date to be, I hope you celebrate it as you see fit. Next year’s 420 holiday will either be an all points epic blaze out or another day in paradise once marijuana is legalized in the state of Oregon on July 1st. It won’t be long before the City of Portland is shrouded in a haze of pot smoke. 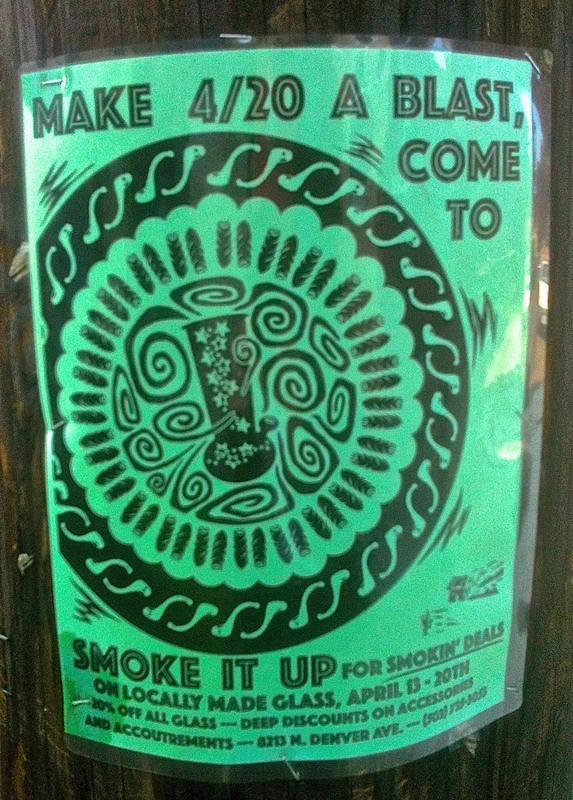 Meanwhile I experienced this mildly hallucinogenic flyer promoting paraphernalia needed to commemorate the April 20th date know to some as 420 Day. It seems like the poster was much brighter when I first saw it. It may well have been a shade of green that popped on a gray day. The appeal for me is the blast of squiggles and smudges encircled by some wormy things that all seem to pulsate and spin around the sparkly glass water pipe in the center of the picture. Stare long enough at the flyer and a contact high seems imminnent. In the meantime celebrate 420 Day anyway you see fit using this image as inspiration.